A sprawling area of South East London overseen by the London Borough of Southwark, in the SE21 postal district. It contains many semi-detached and detached properties, originally built up around Dulwich College (founded in 1619), in the area now known as Dulwich Village (pictured). 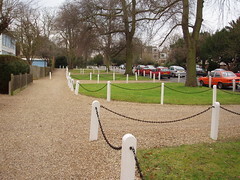 The many parks and fields surrounding the College have long been preserved by the College's governors to ensure that suburbia did not encroach, and as such the area remains one of the most exclusive and up-market parts of London (and one of the areas with the fewest pubs, as well). There has been suburban development around Dulwich Village, with East Dulwich the first to be developed in the late-Victorian era, followed by North Dulwich and later West Dulwich (around the time of the First World War). Last edited 2009-01-07 00:26:19 (version 8; diff). List all versions. Page last edited 2009-01-07 00:26:19 (version 8).